The holidays are a time of tradition, but also reflection for why we celebrate the way we do. And in Sitka, no holiday is as much of a lightning rod for cultural debate as Alaska Day. Historically, October 18th marks the day Russia transferred Alaska to the United States. But in the Alaskan Native community, many regard it as the day their land was lost — bought and sold by colonial powers. KCAW’s Emily Kwong reports on how two perspectives for one holiday collided on the very same hill. The year is 2017, but you wouldn’t know it at first glance. There’s beards and bonnets and soldiers lining the rim of Castle Hill with guns pointing to the sky. 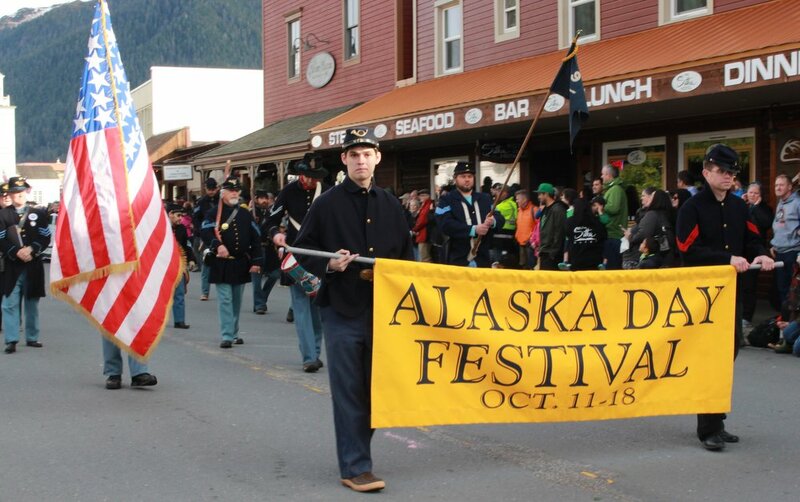 This year’s Alaska Day is the big one for Sitka – the 150th – and even the gun salute will be historically accurate: 42 cannon shots echoing off the mountains. Head bent over a script, Harvey Brandt narrates the historical moment when the Russian flag is lowered and the American flag is raised. “It was an unusually fine day. Like this. Maybe not quite as nice as this,” Brandt said. How by 3:30, a large concourse of people had assembled. “Comprising Americans, Russians of all classes, Creoles and Indians, all eager witnesses of the ceremonies,” Brandt continued. That’s a direct quote from the New York Times on that day. The script is rich with primary source material, folded in by the Alaska Day Committee to make this year’s reenactment as accurate and inclusive as possible. But venture a few paces to the bottom of Castle Hill and there’s a group of people gathered for whom this moment brings a great deal of pain. Dionne Brady-Howard is a member of the Kiks.ádi clan, original occupants of the land. “There’s never really been a time of healing, whether we’re talking about the cultural genocide, the taking of our languages across the state, and all of the trauma that came from being told who we were wasn’t good enough and who we were wasn’t who we should be,” Brady-Howard said. Through social media and word of mouth, her family organized a counter ceremony this Alaska Day to drum and sing their sorrow out loud. The crowd is much smaller than the one atop Castle Hill, but listening intently. Some are Native, some are non-Native. A few are crying. “Anytime race relations are brought up, too often people of color are told how we shouldn’t feel,” Brady-Howard said. Brady-Howard, who is a social studies teacher, goes on to say, “It’s like our African American brothers and sisters in the Lower 48 who are told to just get over slavery.” She then leads the group in an Eagle sorrowing song from the Kaagwaantaan clan. Jennifer Carter is a history-buff of Russian descent, who has always attended the Alaska Day reenactment in the past. But she’s still shaken by a confrontation she saw last year, when a friend brought a sign to Castle Hill thanking her ancestors and was told by one organizer it was disruptive. And Carter plans to attend this sorrowing ceremony, if it happens again, every Alaska Day. You could say that October 18th, 2017 was an unprecedented day in this respect: the historical reenactment was split in two. Some, like AJ Bastian sitting with her kids atop a stone wall, were a little disappointed by that. “It should all be together, so that the children especially who were growing up together should see that we’re all making better choices now than in the past,” Bastian said. While others, like Peter Bradley, protested the reenactment altogether. He passed out a resolution calling for the re-naming of Alaska Day to Reconciliation Day. “There’s a lot of people that are left out of Alaska Day right now, the original people of this land that cared for it for a long time,” Bradley said. Make no mistake: Alaska Day in Sitka is a visibly joyful one: parents off work, a big parade and pie sale. But charged moments like this show that beneath the surface, the traditions surrounding the holiday are fraught. And for Brady-Howard, the traditions are an opportunity to have a conversation. Suggesting that though holidays like Alaska Day come around every year, how they’re commemorated isn’t set in stone.